The Executive Director Forum is a unique opportunity for nonprofit EDs, CEOs, presidents, and artistic/managing directors to connect with their peers, share ideas, and learn from each other in a supportive environment. Generally, each session offers three roundtable discussion groups facilitated by three experienced leaders. The format of the forum allows you to circulate through all three topics and interact with many of the executives in attendance as well as our outstanding discussion leaders. These meetings are a low-effort, low-cost, and high-impact way to gather with your executive director peers and come away reinvigorated and recharged. Participants share problems and solutions and trade tips and resources. 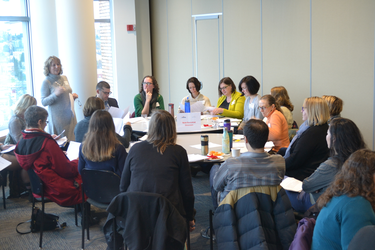 For more than a decade, ED Forum participants consistently report that they left with actionable information and an extra bounce in their step from networking with others in our sector. Mark on your calendar and register for these upcoming gatherings. All sessions take place at Pacific Tower in Seattle's North Beacon Hill neighborhood. Friday, March 1, 2019, 8:30 to 10:30 a.m.
Friday, June 7, 2019, 8:30 to 10:30 a.m.
Friday, December 6, 2019, 8:30 to 10:30 a.m.
Is your organization's budget under $1 million? Email kendra@501commons.org for a discount code to receive free admission. Please see directions and parking information ahead of time. Interested in being a discussion leader? You can also contact Nancy if you have suggestions of relevant topics that you'd like to talk about with your peers. Previous subjects include building inclusive networks, increasing equity in the sector, self-care, developing partnerships, fostering better relationship with the board, fundraising, advocacy, and designing effective programs that properly address your organization's mission.